We announced download source tracking for add-ons hosted on AMO in November, and since then have made a few improvements across the site. We reduced the number of unknown sources by half, from 22% to 11%, by scouring the site to find edge cases where tracking codes weren’t being applied. Now, every install button on the site should have a tracking code. We’ve also added several new codes, such as on mozilla.com’s Firefox Customization page. It’s exciting to see that many add-ons have adopted the external source tracking feature to track downloads from their websites and marketing campaigns, and those downloads now make up 2% of the total. 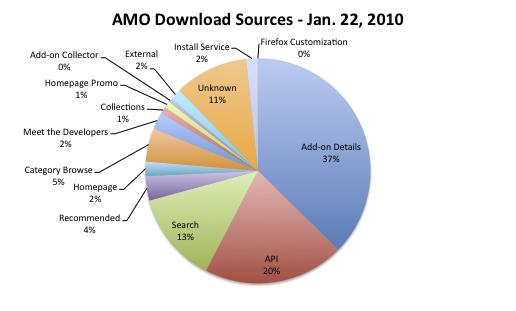 Here’s an updated pie chart showing the source distribution of the 2.1 million downloads last Friday, the day after Firefox 3.6’s launch. We decided to break down the sources further into add-ons that are featured on our site-wide recommended list and add-ons that aren’t. Recommended add-ons are featured on the homepage, the recommended page, and in the Firefox and Thunderbird Add-ons Manager dialog. There are only about 70 recommended add-ons that make up this large chunk of our downloads. The majority of recommended add-on downloads come from the Add-ons Manager (API), and most Add-ons Manager downloads are recommended add-ons (275,000 vs. 155,000). 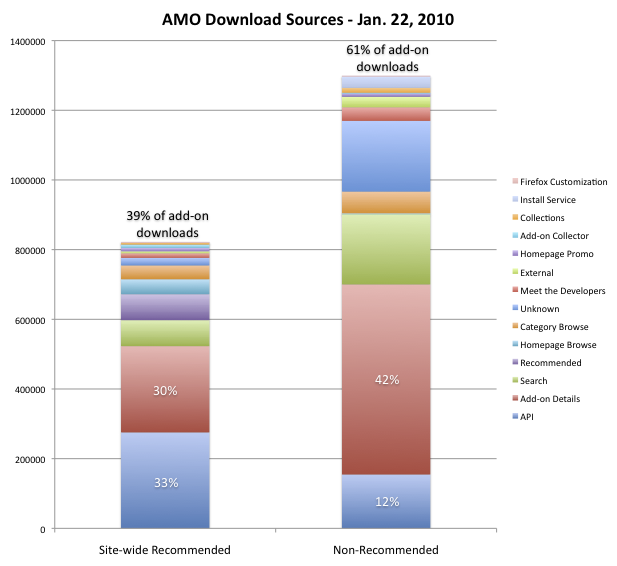 We’re now watching this download source data closely and factoring it into our product decisions as we’re working on the next version of AMO.